The design and development of biomaterials play a significant role in the diagnosis, treatment, and prevention of diseases. When used with highly selective and sensitive biomaterials, cutting-edge biodevices can allow the rapid and accurate diagnosis of disease, creating a platform for research and development, especially in the field of treatment for prognosis and detection of diseases in the early stage. 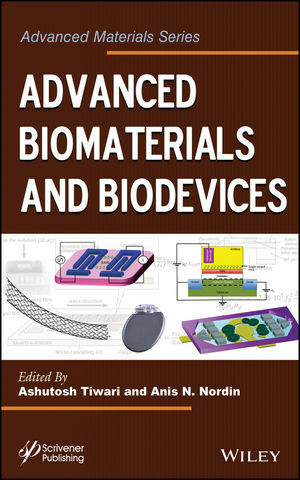 This book emphasizes the emerging area of biomaterials and biodevices that incorporate therapeutic agents, molecular targeting, and diagnostic imaging capabilities. Ashutosh Tiwari is an Associate Professor at the Biosensors and Bioelectronics Centre, Linköping University, Sweden; Editor-in-Chief, Advanced Materials Letters; Secretary General, International Association of Advanced Materials; a materials chemist and also a docent in applied physics at Linköping University, Sweden. He has published more than 350 articles, patents, and conference proceedings in the field of materials science and technology and has edited/authored more than fifteen books on the advanced state-of-the-art of materials science. He is a founding member of the Advanced Materials World Congress and the Indian Materials Congress. Anis N. Nordin received her D.Sc. in computer engineering from George Washington University in 2008. She is now an Assistant Professor in the Department of Electrical and Computer Engineering at the International Islamic University Malaysia, Kuala Lumpur. Her main research interests are in the areas of biosensors, lab-on-chip devices, Analog VLSI, RF-MEMS, surface acoustic wave resonators, and oscillators in particular. She is currently a visiting scholar at the Biosensors and Bioelectronics Center, Linköping University, Sweden.